Prominent & Leading Manufacturer from Ahmedabad, we offer automatic vial cap sealing machine. We are engaged in manufacturing, supply, and export of Automatic Vial Cap Sealing Machine, which are available in various models. 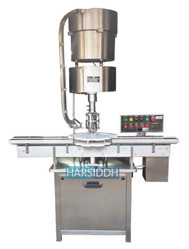 Robustly constructed to perfection, these vial cap sealing machines are provided with high-grade components to ensure their compatibility with desired application in pharmaceutical industries. These machines offer precise & noiseless functionality and require less maintenance.